This time, a purported arrest warrant for Argentine President Cristina Fernandez de Kirchner and Foreign Minister Hector Timerman for reaching a deal with Iran to shield Iranian officials wanted for planning the 1994 bombing of a Jewish center in Buenos Aires was reportedly “found” by investigators in a rubbish bin at the home of Argentine prosecutor Alberto Nisman, the alleged author of the arrest warrant. Nisman is said to have committed suicide in the bathroom of his Buenos Aires apartment on January 18 of this year. Forensics have shown that there was no other DNA found on the gun Nisman is said to have used to fire a single bullet into his head. Kirchner alleged that Nisman’s death may have been a murder carried out by shadowy intelligence figures trying to discredit her and her administration. Kirchner has taken a decidedly anti-Israeli position with her support for Palestine and the establishment of friendly relations with Iran. Kirchner’s foreign policy has irked the Israelis and Mossad, which have a heavy presence in Argentina. Kirchner announced that because of her suspicions about agents within the Argentine SIDE intelligence service carrying out a hit on Nisman, she was scrapping the agency and replacing it with a new federal intelligence agency. Presumably, such a move would clean out any Israeli intelligence plants who may have assisted in the possible murder of Nisman — what would amount to a classic Mossad “false flag” operation in sacrificing a single Jew — Nisman — for the greater goals of Israel. Only photographs of the alleged 26-page arrest warrant were published by the anti-Kirchner newspaper Clarin. Goldman Sachs is a major investor in the Clarin Group, Clarin’s parent company. 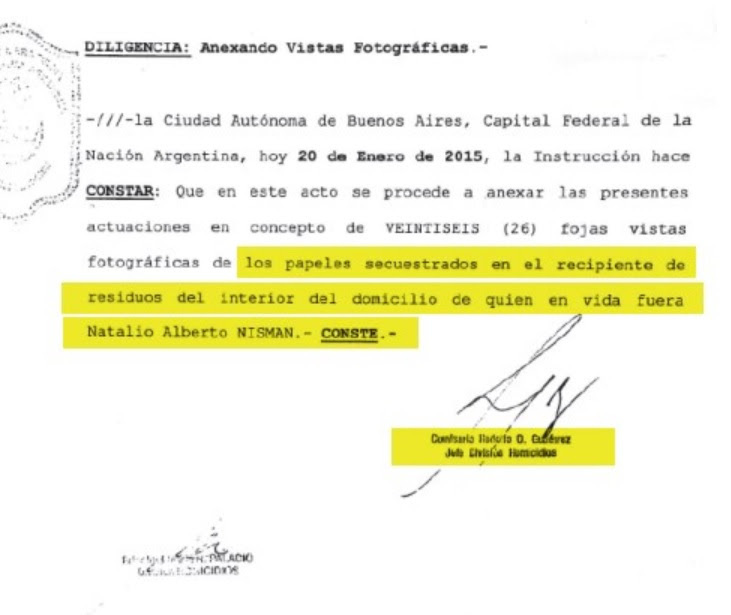 At first, Nisman’s assistant prosecutor, Viviana Fein, denied the existence of the arrest warrant. However, she later changed her story and confirmed that the warrant published by Clarin was authentic and that she “mis-spoke” in her earlier statement. It is instructive to note that Nisman was Jewish as is Fein, an important fact that The New York Times chose to ignore in its reporting on the story. The role of Clarin in disseminating anti-Kirchner is no surprise. The Western media has failed to report that Foreign Minister Timerman, named in the dubious “arrest warrant” is himself a newspaper editor and a longtime competitor, as was his father, Jacobo Timerman, of Clarin. The elder Timerman published the leftist La Opinion and his son, the present Foreign Minister, was editor-in-chief of La Tarde, also left-wing. Attempts by the Israel Lobby to tar Kirchner fall flat in the face of the fact that the Timermans are Jewish but not beholden to Israeli or Zionist interests in Argentina..
Argentina’s President Cristina Fernandez de Kirchner witnessed her September 24 speech to the UN General Assembly interrupted by what UN officials called “technical difficulties.” In fact, Kirchner’s speech was censored by the UN amid catcalls from the Israeli delegation and New York Zionist Jews specifically placed by the Israelis in the public gallery to boo those world leaders who criticized the Jewish state’s policies. Kirchner has been subjected to a vicious Zionist campaign launched against its financial system by the Elliott Management Fund, the “vulture” hedge fund owned by New York Zionist and neo-conservative Republican Paul Singer. In 2002, after Argentina defaulted on its debt, Singer’s Cayman Islands-based NML Capital Limited bought the devalued Argentina bonds knowing full well he would be lucky to get 30 cents on the dollar. However, Singer began a shake down of Argentina to squeeze more money out of its financially-troubled economy. NML convinced Ghana to seize the Argentine naval training ship Libertad in 2012. Mark Brodsky, Singer’s former Elliott Management Fund executive and now head of Aurelius Capital Management, joined in the extortion of Argentina in demanding that a portion of the $1.2 billion debt be paid not only to Singer but also to his fund. The Israeli media avoids the use of “vulture” funds to describe contrivances like those of Singer and Brodsky. It prefers to use “hold-out funds,” which places the onus on the debtors and not the unscrupulous collectors. A Singer-owned U.S. federal judge in New York, Thomas Griesa, ordered Argentina to pay all the money Singer was demanding instead of a reduced amount. Griesa is 85 years old and is known for taking naps on the bench while hearing cases. In June, the U.S. Supreme Court, on which three American Jews [Ruth Ginsberg, Stephen Breyer, and Elena Kagan] sit and who did not recuse themselves from the case, decided to reject Argentina’s appeal of Griesa’s ruling. The Supreme Court’s ruling on the Argentina case was purely political. Argentina had determined, contrary to Zionist and neocon myth, that Iran was not responsible for the 1994 bombing of the Argentine Israelite Mutual Association (AMIA) building in Buenos Aires, which killed 84 people. Kirchner and other Argentine investigators later discovered that the bombing was an Israeli-inspired false flag operation intended to embarrass Argentina’s President Carlos Saul Menem, who was the son of Syrian immigrants to Argentina. Israel was upset with Menem because he strengthened Argentina’s ties to Iran. Menem was forced to abandon an Argentine nuclear cooperation deal with Iran following the 1994 bombing of the AMIA. The U.S. ambassador to Argentina at the time of the bombing James Cheek, told The Nation magazine, “To my knowledge, there was never any real evidence [that Iran was responsible]. They never came up with anything.” The only evidence of any links between the bombing and any Iranians is the fact that “evidence” of the Iranian government’s alleged involvement was manufactured by the anti-Tehran Iranian terrorist group Mojaheddin-e-Khalq (MEK), which receives funding and other support from Mossad and the CIA. After the bombing of the AMIA, Mossad planted evidence at the scene. Two years earlier, after a bomb at the Israeli embassy in Buenos Aires killed 22 people, Mossad also planted evidence suggesting Iran was behind the attack. Realizing that Menem had been subjected to a vicious character assassination campaign by the Zionist media, Kirchner set about to inform the General Assembly of Israel’s culpability in false flag attacks. Perhaps no better setting than the UN could have been used by Kirchner less than a two weeks after the commemoration of the 9/11 attacks on the World Trade Center, which amounted to yet another false flag operation that bore all the trademark Mossad handiwork. After the appearance of the dubious Nisman arrest warrant in Clarin, it was discovered in U.S. State Department cables released by WikiLeaks that Nisman had maintained extensive contacts with the U.S. embassy in Buenos Aires, which helped him prepare his “case” against Kirchner’s government over the AMIA bombing. Nisman continuously met with U.S. embassy officials who helped him hammer out his strategy against Kirchner. Classified By: DCM Tom Kelly for reasons 1.4 (B) and (D). ¶1. (U) Summary. Treasury Assistant Secretary for Terrorist Financing and Financial Crimes David S. Cohen traveled to Buenos Aires, Argentina, on October 2 to address members of the U.S.-Latin America Private Sector Dialogue (U.S.-LA PSD) and conduct meetings with the Central Bank of the Republic of Argentina (BCRA) and Ministry of Justice and Human Rights (MOJ) . . .
¶7. (C) A/S Cohen also met with Special Prosecutor Alberto Nisman, who in late 2006 formally accused the government of Iran of directing the 1994 Argentine-Israeli Mutual Association (AMIA) bombing, and Hizballah for carrying out the bombing. Earlier this year, Nisman formally requested that the governments of Germany and France freeze four bank accounts containing over US $48 million associated with the AMIA suspects. Nisman said that he has yet to receive a substantive reply from either Germany or France, and A/S Cohen offered, on behalf of the Treasury Department, to engage counterparts in these two countries to follow up on Nisman’s requests. Nisman added that he has also requested that a judge order the arrest of former Argentine president Carlos Menem for participation in a cover-up after the AMIA attack. 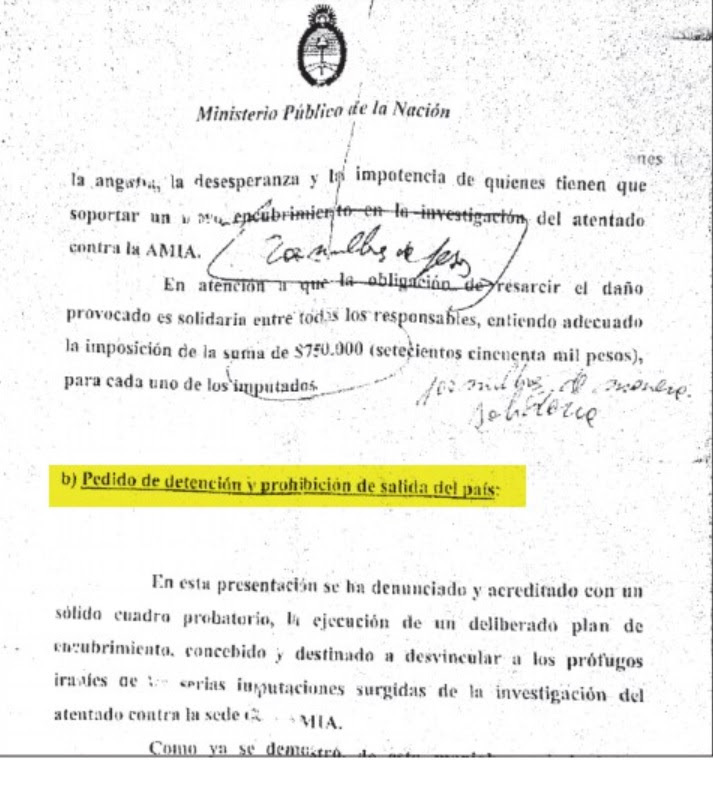 An additional cable, gated May 2009, shows that Nisman was in Washington to hold meetings with the State and Justice Departments and “other U.S. government agencies.” Other cables indicate that the U.S. Justice Department and FBI assisted Nisman in preparfing INTERPOL arrest warrants for Iranian officials suspected in the AMIA bombing. ¶1. (C) Special Prosecutor Alberto Nisman called on the Ambassador May 19 to notify us that the following day he would ask Judge Rodolfo Canicoba-Corral to indict a new suspect in the 1994 bombing of the Argentine Jewish Mutual Association (AMIA). Nisman described his painstaking effort to establish the suspect’s links to both the environs of the AMIA site, a mosque in Buenos Aires, and his links via cell phone calls to Iranian diplomat and bomb plot suspect Mohsen Rabbani and a cell phone in the Tri-Border Area registered in the name of “Marques.” Although the suspect, Samuel Salman El Reda, is Lebanese-Colombian, Nisman considered this a first step against a “local connection” — that is a resident or Argentine citizen who had helped the Iranian and other suspects, a connection long of interest to the victims of the attack and AMIA. Nisman said El Reda has an Argentine wife and thought both are now living in Lebanon. ¶2. (C) Nisman described the indictment of El Reda as a substantial breakthrough and as asked that we closely hold his name until it is made public, probably on May 20. Post notes that El Reda has been named in the past as a suspect in the 1992 Israeli Embassy bombing and the 1994 AMIA bombing, based in part on investigations by the Argentine intelligence service (SIDE) and others. For Nisman, the breakthrough appears to be that he has pieced together enough evidence independently of the discredited first AMIA investigation to single out El Reda and pursue the indictment. ¶3. (SBU) Post will report further on local reaction when the indictment is made public. ¶4. (SBU) Action request: Nisman said that he will be in Washington June 15-20 and would be available to visit the Department of State or Department of Justice or other USG agencies for briefings. Washington offices are asked to contact Poloff Ted Craig by email (craigtj@state.gov) or phone (54 11-5777-4858) to arrange a meeting. 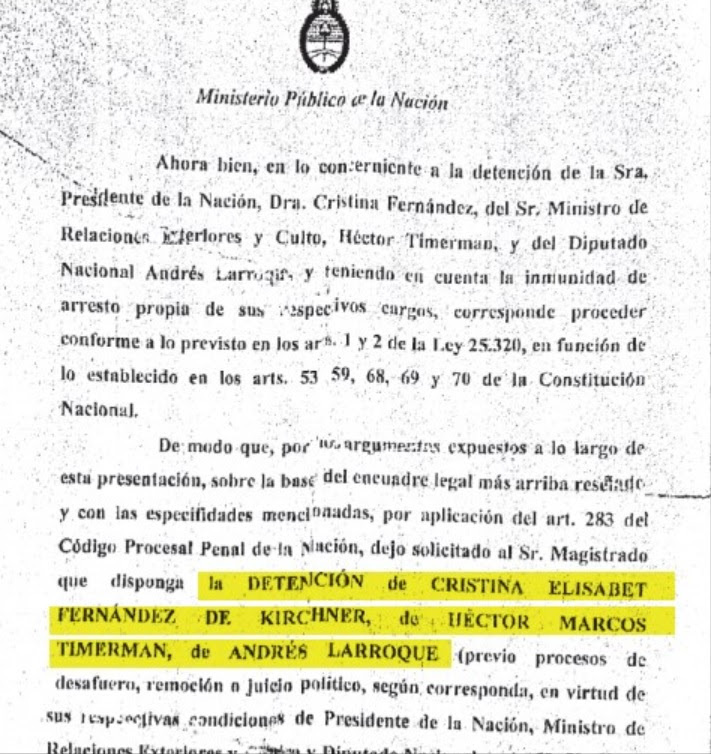 The alleged arrest warrant for Kirchner and Timerman was supposedly drafted by Nisman in June 2014. Two successive judges, Ariel Lijo and Daniel Refecas have passed on considering Nisman’s case against Kirchner due to lack of evidence and other procedural issues. The alleged Argentine prosecutorial arrest warrant for Kirchner, Timerman, and National Deputy Andres Larroque has the same neocon “taint” about it as did the forged Niger government and Iraqi Oil Ministry documents. The neocons’ stock-in-trade, thanks to the sometimes half-witted efforts of their Mossad allies, include crude forgeries, fake passports, and fake videos and photographs. 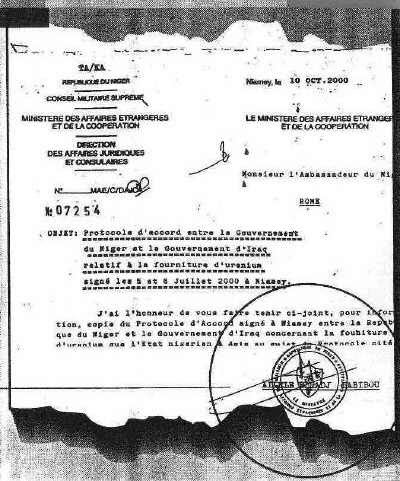 Forged Niger Foreign Ministry documents purprting to show that Iraq had obtained yellow cake uranium Niger. The International Atomic Energy Agency (IAEA) and the CIA determined the documents were crude forgeries. British MP George Galloway’s meetings with Saddam Hussein and Tariq Aziz were used by the neocons to intimate that he had received bribes from Saddam’s government as part of the United Nations’ Oil-for-Food program. 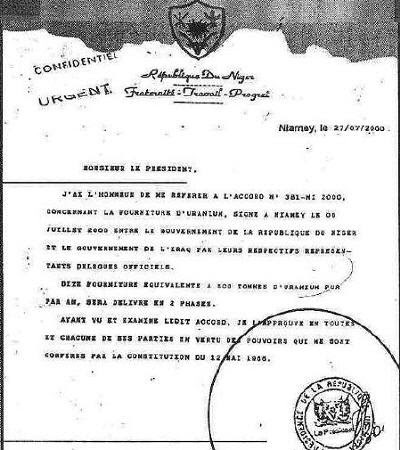 Crudely forged documents, with “Liquid Paper” edits clearly visible were “found” by Western intelligence at the Oil Ministry and used to tarnish anti-war Western politicians in Britain, France, Russia, and other countries.